Brilliant price. You would pay £70 just for the casserole dish. 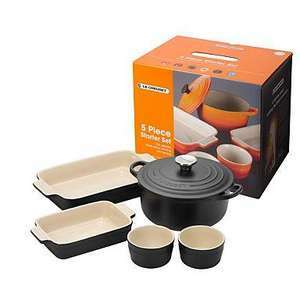 However 20cm casserole dish is only small, mayb serve 2-3. I can't argue with that. HOT! I already have a couple of these so will add to the collection. Amazing price. Thanks op. Ordered but betcha they wont honour them. Great price - have bought for as a new home present for my nephew....just trying to decide whether I "need" one as well! Good price for a starter set so heat added! Why so? They got a rep a la Tesco? Got a set in black to go with our set in red along with a Denby utensil set.. lovely stuff! Just ordered the orange starter set, hot! Thanks for this. Well spotted and thanks for posting it! Scorchio! Very good price. Have bought this to add to my existing set of le creuset in satin black. Thanks, ordered the black set, I need a house now so got to start saving lol! And stop looking at hot deals! Not yet Reviewed. Be the first to write a review. ordered. thank you very much. Just ordered for my sisters wedding present. Thanks OP. Just rang them up, they said it looks like an error so they will investigate. At the end of the day it's just the same as any other cast iron / stoneware, just paying for the name really. So not that bothered. Just rang them up, they said it looks like an error so they will … Just rang them up, they said it looks like an error so they will investigate.At the end of the day it's just the same as any other cast iron / stoneware, just paying for the name really. So not that bothered. Why did you ring out of interest? Great deal! Just ordered several bits from there. Thanks! Logged in for the first time in months just to add heat. So why ring them ?? A Mod must have disliked my comment before Ordered this when your first posted it, cheers OP. Also just went back and ordered tea pot, sugar bowl and hug for £13 delivered + TCB. You really can't buy this stuff any cheaper.